When we went to the Lake Oswego farmer’s market a week or two ago, I was pleased as punch to find a big pile of fava beans at one of the stalls. I’ve never seen them at the greenmarket here in Salem, just at LifeSource, and these were huge, beautiful pods that I couldn’t pass up. I got enough to really make them the centerpiece of a meal, so I spent quite a while trying to decide how to put them to use. 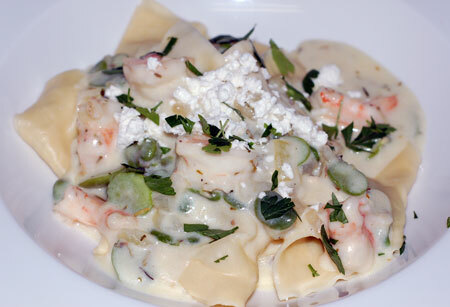 I knew I wanted to combine them with shrimp in some fashion, and I ended up making fava bean raviolis with a shrimp and herb cream sauce that was really delicious, if rather a lot of work. I started out shelling, blanching and peeling—despite the insistence of the stately Italian lady at the farmer’s market who told another woman (who hadn’t yet ever tried favas) that they don’t need to be peeled or even shelled. I do want to try grilling them whole sometime, but so far I haven’t been brave enough to eat them that way because I’m concerned about the texture. These were huge favas, much larger than the ones from LifeSource, and I definitely needed to blanch and peel them. I started working at 4:30pm, and I think it ended up taking me about an hour to end up with a cup or two of slippery emerald beans. From there, I’ll outline what I did, though I wasn’t really watching amounts. *Make fava bean puree by covering with water 2 sliced Yukon gold potatoes, the favas, a sprig of fresh rosemary and half a bunch of sliced green onions and simmering until they are tender and the water has boiled off; add 3 T butter to melt, then puree with a stick blender until uniform. (Take time out to marvel at the fact that your puppy is enchanted by the smell and taste of the fava puree, and tried her darndest to stick her face in the bowl on top of the counter.) Add 2 oz fresh goat cheese and stir through while warm. It will be as thick as mashed potatoes, not watery. Cover and set aside. *While working on favas and puree, thaw, peel and drain 8-10 shrimp, cut in half, and marinate in olive oil, garlic, salt and pepper, and a sprig of fresh rosemary. *Make pasta dough: 1 C flour and 2 large eggs, from Marcella’s recipe, kneaded until smooth and wrapped in plastic wrap. *Start herb sauce: 1 C 1% milk and 3/4 C chicken or shrimp stock, warmed in microwave. Make a roux with 1 T each butter and flour, add warm liquid and a branch of fresh thyme, and simmer, stirring occasionally until it begins to thicken. Turn heat down to low and cover while making pasta. *Additional elements for sauce: In a small skillet, sauté 1/2 C chopped sweet onion and fava beans for garnish in olive oil until onions are translucent and beans begin to soften; add shrimp with marinade (remove rosemary sprig) and cook just until pink; remove from heat and reserve. *Run pasta dough through crank to desired thinness, cut into squares for ravioli, and fill with a teaspoon or so of fava puree, sealing edges well. Flour and cover as you go so they don’t stick together or dry out. Meanwhile, heat a large pot of salted water. *Drop raviolis in the water to cook for a few minutes. Meanwhile, turn up the heat on the sauce, add a splash of heavy cream, and bring to desired temp and texture; add in the shrimp/fava mixture to warm. *Toss drained raviolis with sauce and put on warmed plates, topped with crumbled goat cheese and some fresh chopped parsley or chives. I think we finally sat down to eat about 4 hours after I started shelling beans, so it was quite the marathon prep, but worth the effort. I barely made a dent in the bowl of fava puree, though, and it was so delicious (I can’t blame Freyja for wanting to sample it) that I’ll definitely have to come up with alternate uses for it. I’m thinking crostini or sandwich smear, thinned with stock for soup, mixed into risotto, or perhaps even made into fava gnocchi.